With overnight temperature yet again down to minus 4oC and afternoon highs still well short of double figures, the last day of March, Easter Sunday and, coincidentally, the first day of British Summer Time saw no real signs of Spring as I headed for the ridge top at the southern tip of the Brecon Beacons National Park once again. True, daffodils were in flower along the road verges but then they have built-in antifreeze. True also that the lowest field before striking up the ridge was full of ewes and their newborn lambs but they were desperate for food, cropping the grass to the ground faster than it could grow. The ewes bleated their discomfort and as I crossed the field hustled me from behind, hoping I was bringing them something to eat. One lamb lay at the edge of the wood, dead from the cold and lack of milk, its eyes pecked out by ravens. There will be more casualties if this weather continues. 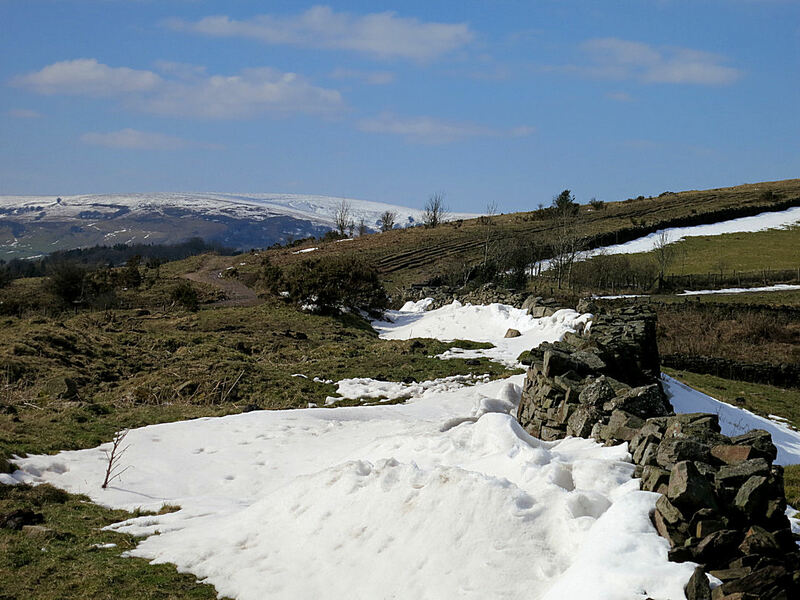 The snow has now largely gone from the fields but persists on the highest parts of the ridge and where it has drifted deeper in hollows and in the lee of hedges and walls, though even there noticeably reduced by ablation. In the midday sun meltwater collects, forming a thin slurry, unable to penetrate the still-frozen ground. On the ridge-top path a small stream flows under the remaining snowdrifts, emerging on the further side, certain to refreeze as temperatures fall again as the sun dips down and night draws on. The weather is often anthropomorphised, as if it were sentient: winter is “reluctant to release its grip”, “lingers on”. But the cold facts speak for themselves: the coldest Easter Sunday in the UK since records began; the coldest March for 50 years; joint third coldest for Wales since records began. And forecasters reckon the cold weather will continue well into April. 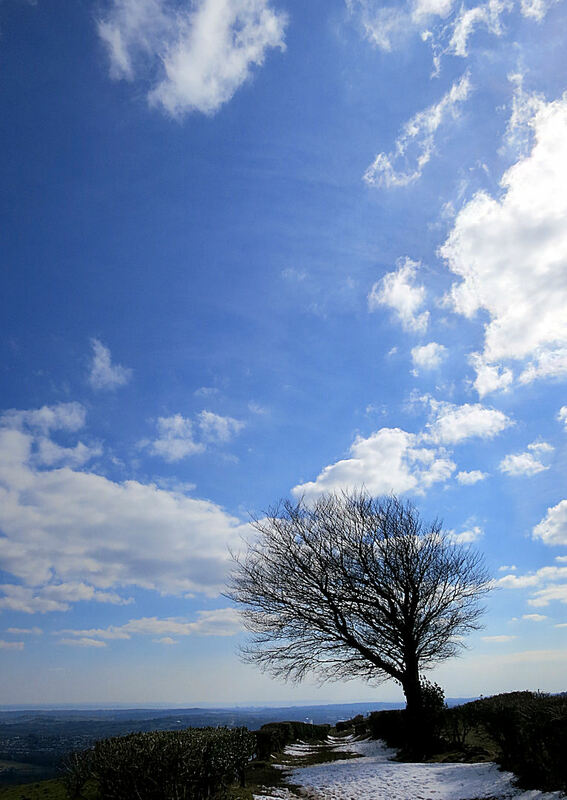 But, a big BUT, though it is still cold, on Easter Sunday the grey high pressure gave way to sunshine. Not cloudless blue sky and unbroken sunshine but warm enough to sit outside for coffee when I got back from the mountain, bright enough to lift the winter gloom, a tantalising glimpse of a Spring yet to come. Deeps snow drifts reduced in height but will still be around for a while to come. 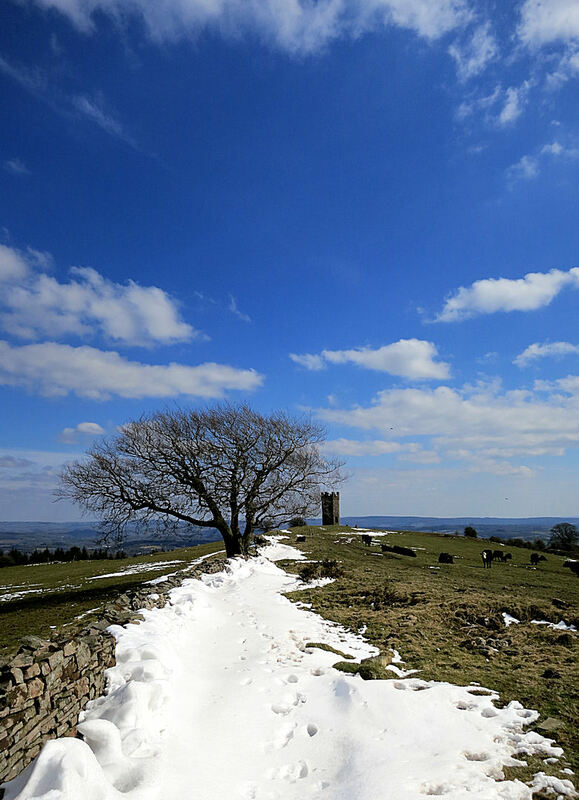 This entry was posted in Mountains, Pontypool, Spring, Wales, Winter and tagged brecon beacons national park, Bristol Channel, Easter Sunday, midday sun, Mynydd Varteg, newborn lambs, snow, snow drifts, spring, winter, winter gloom, winter walking. Bookmark the permalink.